Ruykan ice is ideal for all climbers, learn to lead, push your grade, mixed routes, grade 6. Ruykan is the La Grave of Norway. It s situated in Southern Norway about 4 hrs drive north of Oslo. It is famed for the heavy water plant at Vermork, which the Germand tred to produce heavy water. This plant was destroyed by Norwegians in a great war time story. The power plant is now a great museum. Now climbers take over from visiting soldgiers. With over 200 ice routes from 80m to 800m. Its a paridise for ice climbers who enjoy mileage climbing rather than mileage on approaches. All climbs are very close to your car. Many routes start in the main gorge running through the valley but others do start high up on surround plateau. Its an ideal place to learn the craft of ice climbing. There are many great routes for a budding leader to cut their first ice lead on. The conditions are generally very good from December to March. You can also ski on the surround hills for most of the winter. The area has a wide range of climbing areas and size of cascades. This is great for those who wish shorter days to get a feel for the climbing and then there longer routes for big days out. Theres classic routes on each cliff and around each crner of the gorge. Ruykan its self has plenty of cafes and shops. Theres always a bunch of climbers about to add to the atmosphere. Accommodation There are plenty of options here. A popular place to stay is the Climb Inn up nr the Vermork Gorge. Stumbling distance from the ice routes. It offers a full or half board options in a comfortable setting. For cheaper options there are plenty of bunkhouse options closerr to the main Town. Rora Bothies offer a self catering option in wooden huts, common throughout Norway. Programme Its a perfect area to climb single and multipitch routes of all grades. Most climbs are a short drive away so you can sometimes hit sometimes a couple of venues. Generally a single pitch day in the gorge gets most climbers warmed up for the main event. Long routes galore Ruykan can offer excellent climbs for a budding leader to experience the climb of your life! After each day a general cafe/bar stop brings the day together. The Gorge has atmosphere as a climbing venue. You are climbing out a big canyon which has ice dripping everywhere. The Ice Park is near the Vermok Bridge. Its a climbing area created by water ppes put in place by local climbers. The most popular area and a great place to start your week. Masses of single pitch climbs with good belays either bolts or off trees. Easy access and popular. 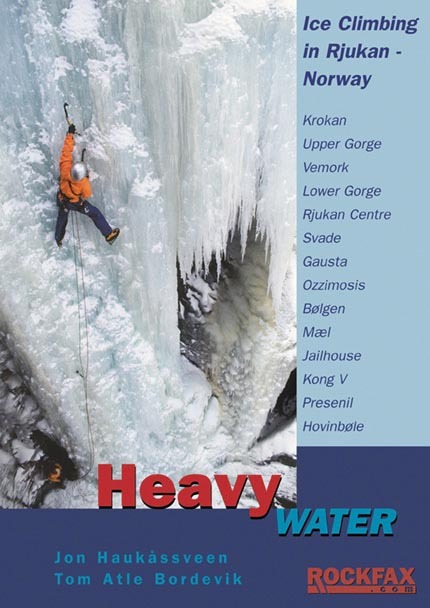 From the town you can approach many quality long multipitch ice routes. Ideal big days out and close to the cafe. Fly to Oslo eith Ryan Air, BA or Norweign. Hire car to venue.